The Swiss Classic 8cm Pointed Tip Serrated Paring Knife by Victorinox features an ergonomic handle that fits nicely in your hand, as well as a sharp blade that holds its edge. No matter what you're about to prepare, the Paring Knife will help you do it. Small, sharp and agile, this knife is delicate enough for delicacies and tough enough for the toughest meats. Keep it close at hand and cut, slice and carve your way through to a beautiful meal every time. 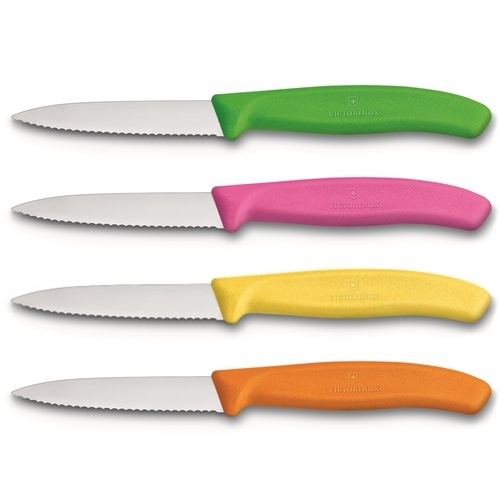 Swiss Victorinox knives provide a superb range of professional chefs knives. Founded in 1884, Victorinox are best known as the biggest manufacturer of pocket knives in the world, thanks to their trademark Swiss Army Knives.